View of Christopher Wren's Library for Trinity College Cambridge. This shows the garden facing side of the library, the west side facing Nevile's Court. Wren's library was built between 1676-1690. It built of creamy Ketten stone with a pinkish hew. The ground floor on the river facing side seems rather closed, but on the upper level is the library with its large arched windows. 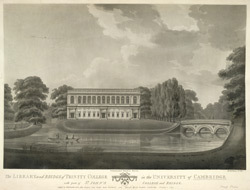 The library building was very striking for its time, and its unfussy classical style contrasted with the rest of college buildings at the University.